Finding the ideal pencil sharpener for work, school, home, or somewhere in between doesn’t have to be “dull” thanks to our electric pencil sharpener reviews! We’ve researched best-selling electric sharpeners to find the best options for a range of applications. Before zipping down to the reviews, take a look at the following features to consider when comparing electric pencil sharpeners. Pencil - Some sharpeners only handle standard-size graphite pencils. Others can take on colored and jumbo pencils, too! Auto-Stop - Most electric pencil sharpeners today stop when the pencil is sharpened or if the shavings tray is removed. Quiet Motor - Nobody likes a sharpener that sounds like a jet taking off, so we looked for sharpeners with quiet motors. Power Source - Battery-powered options are convenient and portable, but plug-in sharpeners can have more powerful motors. Dimensions - How big is it? From pocket-sized to heavy-duty monsters, pencil sharpeners come in a range of sizes and shapes. Warranty - Longer warranties are common in commercial-grade sharpeners, and are a sign of the product’s quality. Ready to take some notes? Our top pick and budget pick pencil sharpener reviews summarize our overall favorite options. However, if you’re looking for something in-between, keep reading! Your perfect sharpener awaits! The best electric pencil sharpener for colored pencils and more is the hard-to-beat X-Acto High-Volume Commercial Pencil Sharpener Model 41. 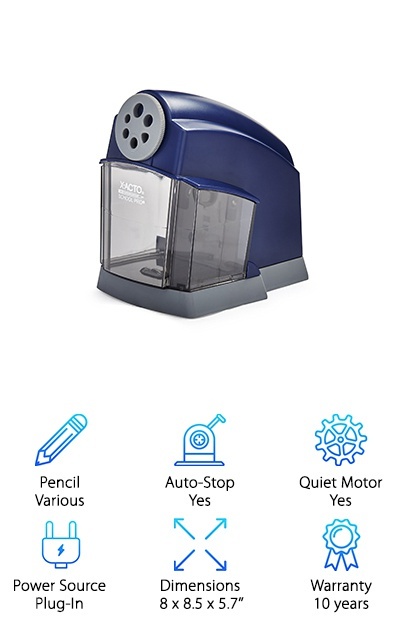 Designed to handle the demands of high-volume use in a classroom or office setting, this heavy-duty pencil sharpener is the most powerful in the X-Acto line. It includes an overheating protection, plus an internal fan helps to keep the motor cool during extended use. The dual helical blades work quickly to create a sharp tip without oversharpening thanks to Pencil Saver technology. The metal base provides durability. Combined with the non-skid feet, this helps to keep the unit in place during use. You can also adjust the pencil guide to sharpen different sizes of pencil. The large shavings tray can handle tons of shavings, and the motor won’t operate when the tray is removed. X-Acto finishes off this product with a stunning 10-year warranty that puts their money where their mouth is! Our budget pick for the best electric pencil sharpener is this option from MROCO. 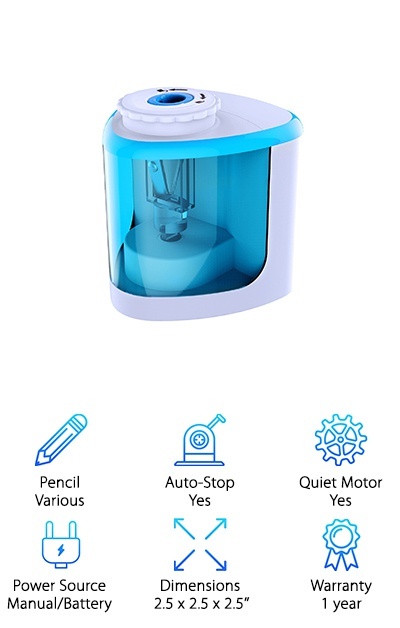 Besides its low price, this pencil sharpener is perfect for for kids since it can be used as a manual sharpener while blocking access to the blade area. It can also run on batteries to do the sharpening for you. It has an ultra-compact size and comes with a spare blade for replacement down the road. Although a helical blade provides a straight, even point more consistently, this traditional pencil sharpener blade should work well for basic use for young students and children. While in battery mode, the motor won’t activate if the shavings tray is not in place. It also has rubber feet to help keep the sharpener in place during use. Does your child need a sharpener they can use safely while they do their homework? This dual-mode sharpener works quickly and won’t make a mess! This heavy-duty vertical pencil sharpener from TeachingMart is ready to help you take on back-to-school. It uses plug-in power, so you don’t have to deal with low batteries and constant battery changes with heavy use. The single-hole design works for most typical-size pencils, including regular and colored pencils. The large shavings reservoir is easy to remove and empty, but you won’t need to do that often! The unit stops automatically when the pencil is fully sharpened, and also won’t turn on if the shavings tray is removed for safe operation. Combine this with helical steel blades, and you’re on your way to a perfectly sharp tip without over-sharpening. Non-skid rubber feet help to keep this sharpener in place during use. The heavy duty motor can handle high volume use in classrooms, offices, and art studios. Plus, the vertical design saves space compared to bulkier horizontal sharpeners, so it’s great for small areas! Looking for a simple battery-powered pencil sharpener? This compact option from TripWorthy is one of the best electric sharpener options in that category. It can sharpen graphite pencils and colored pencils, perfect for casual artists, students, and home use. You can also stick it in a work bag or artist kit to take with you on the go! An auto-stop safety feature kicks in if the shavings tray isn’t in place. Children and adults alike can use it safely and easily. It takes up very little space, making it ideal for small home offices or taking it along traveling. Made with high-quality, heavy-duty parts, this pencil sharpener is sure to become a staple for artists, students, and more! Kids can get the hang of it and learn to sharpen pencils on their own, all without making a mess. The shavings tray is large enough to hold the shavings from sharpening ten or more new pencils. The helical blade produces a sharp, even point every time! 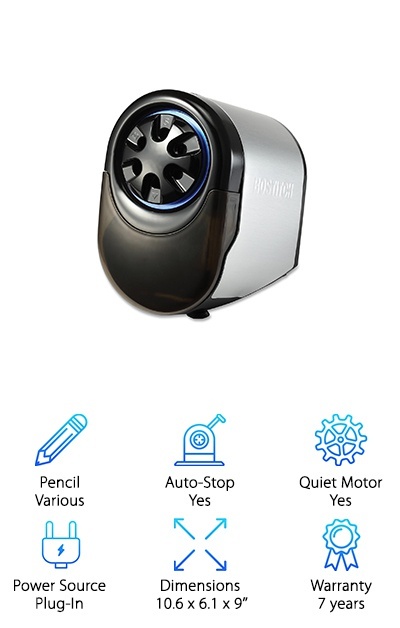 The Etekcity Electric Pencil Sharpener is a good choice for home use and for artists who go through a lot of graphite pencils and colored pencils. It plugs into any standard outlet, so you’ll have consistent power even when you’re going through boxes of pencils! The sharpener automatically pulls in and then dispenses out the pencil when it’s finished sharpening. That makes it incredibly easy to use with just about any standard-size pencil. A reverse button helps to take care of jams with minimal damage to the pencil. The shavings tray can hold the shavings from up to 50 dull pencils, so you won’t have to constantly empty it. Anti-skid padding on the base helps this sharpener stay put while in use--no need to chase it across your desk! If you’re looking for a simple but effective pencil sharpener for standard-diameter pencils, this option from Etekcity is a great pick. The BOOCOSA Electric Pencil Sharpener is perfect for every-day pencil sharpening needs. It sharpens standard-size colored and #2 pencils, automatically starting and stopping when the pencil is fully sharpened. The helical steel cutting blade provides the perfect point every time, and the compact design keeps it from taking up too much of your workspace. This pencil sharpener comes with an AC adapter for plug-in power, but you can also install batteries to take it with you on the go! The large shaving tray lets you sharpen more and spend less time cleaning your sharpener. The sharpener won’t run when the shaving tray is removed. 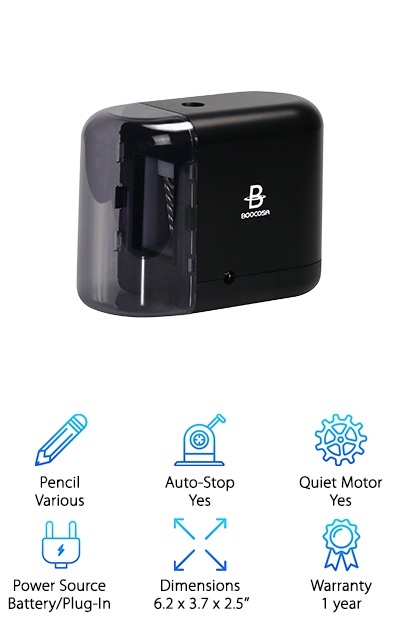 If you’re looking for a compact electric pencil sharpener that you can take on the go or plug in for reliable and consistent power output, you’ll love this option from BOOCOSA! Take it with you wherever you go or set it up in your home, office, or classroom. Looking for the best electric pencil sharpener for artists? 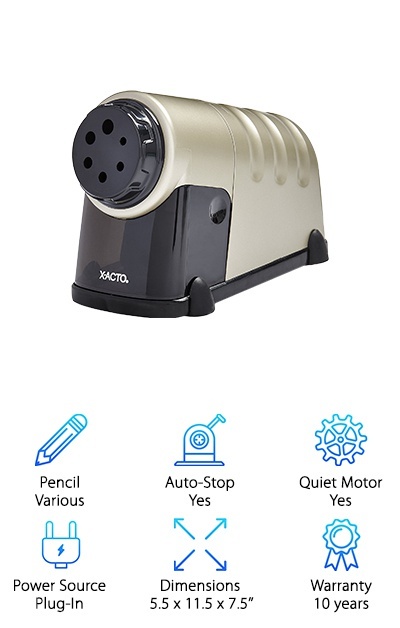 Designed for classroom use, the X-Acto SchoolPro Electric Sharpener works well for the classroom, office, and art studio. The sharpening mechanism stops automatically when the pencil is fully sharpened, if it starts to overheat, or if the shaving tray is removed. Helical steel cutter blades produce safe points with a slightly rounded tip, and the flyaway design helps to prevent over-sharpening. The electric motor is quiet and powerful, and the XL shavings tray ensures that you won’t have to empty the reservoir often. The tough plastic body and non-skid feet help the sharpener hold up to high-volume use. A rotary dial lets you adjust to sharpen a range of pencil diameters. This tough sharpener packs a ton of value into a low price, too, perfect for artists and teachers on a budget. The cherry on top: a ten-year warranty on the motor and a two-year warranty on the cutting mechanism! 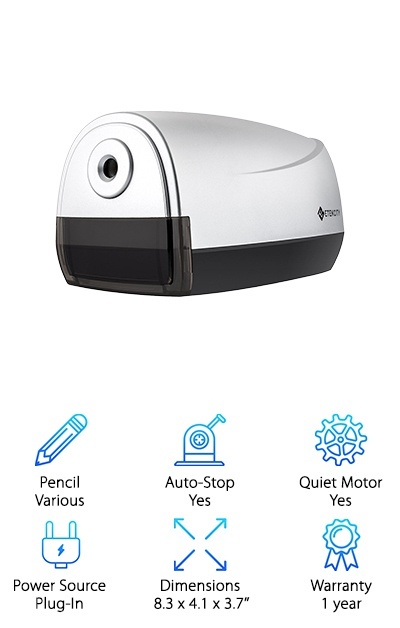 The Bostitch Antimicrobial Classroom Sharpener just might be the best electric pencil sharpener for teachers, and the answer to their prayers! It starts off right with a fast and quiet motor with multiple pencil size options. It stops automatically when the pencil is fully sharpened, if the shavings tray is removed during use, or if it gets too hot. The sharpener area lights up once sharpening is complete. There are a few features that make this sharpener perfect for the classroom, though. The Tool-Free removable cutter cartridge makes it easy to clean out the cutter blades or replace them as needed, making this a long-life pencil sharpener option. The brushed metal case and suction cup feet provide the durability and stability required for surviving in the classroom. Plus, it’s antimicrobial-protected to help limit the spread of germs. The seven-year warranty is just the cherry on top at this point! 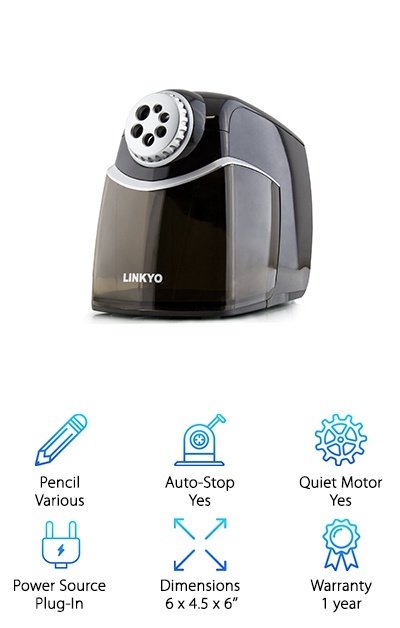 The Linkyo Heavy-Duty Sharpener is designed for high-volume use in settings like a classroom, art studio, or busy office. The adjustable rotary insert tailors the sharpening to a wide variety of pencils from 5mm to 11mm in diameter. This includes colored pencils, jumbo round pencils, and triangular pencils as well as standard ones. The heavy-duty helical steel blade works quickly and efficiently to sharpen your pencils in a jiffy! The plug-in power source is convenient since you don’t need to worry about low batteries and constant replacements when the sharpener is regularly used. The extra-large shavings reservoir is also ideal for high-volume use since it doesn’t need to be emptied often. Non-slip rubber feet keep the sharpener in place during the sharpening process, too. 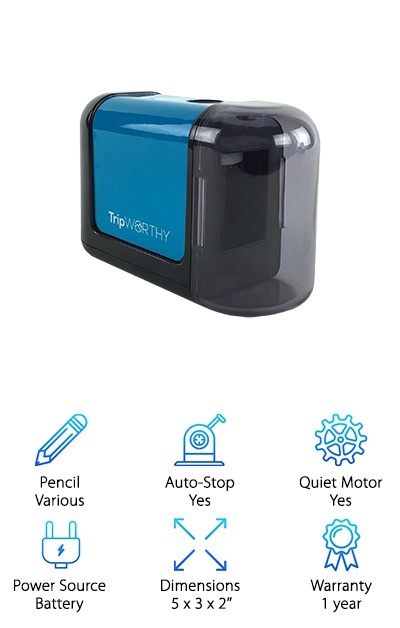 The versatile sharpening options and heavy-duty features definitely make this a top pick for the best electric pencil sharpener for classrooms! 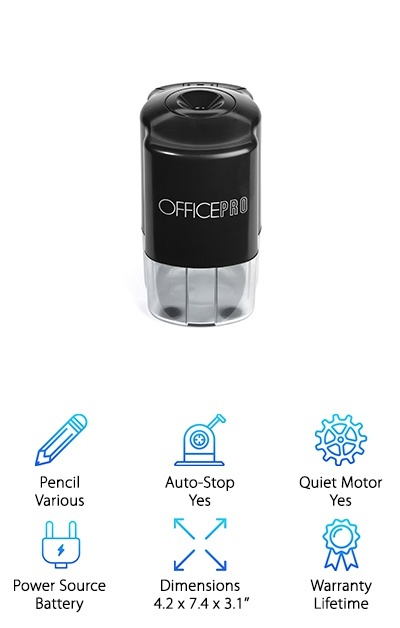 The OfficePro Electric Pencil Sharpener is a battery-powered portable pencil sharpener compatible with colored pencils and a variety of regular graphite pencils. It has a vertical design shaped to be easy to grip and a reservoir to catch shavings. The large reservoir size keeps you from needing to constantly empty the tray of shavings. The helical stainless steel blade is razor sharp and durable, stopping automatically when the pencil is fully sharpened or when the shavings reservoir is opened during sharpening. This small but speedy pencil sharpener is powered by four AA batteries and easily fits into backpacks and artist kits for easy sharpening on the go. A lifetime replacement guarantee for extra peace of mind while you sharpen! 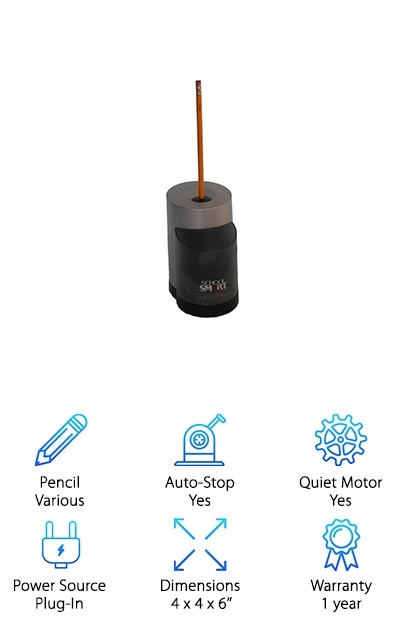 This sharpener has a strong motor, so it breezes through dull pencils instead of wheezing. It operates quietly, too, so it can work well as a classroom pencil sharpener or in a quiet office environment.